17-120mm T2.95 lens provides cinematographers and broadcast operations with a compact, lightweight design (only 2.9 kg) using Canon optical elements, while offering outstanding performance and reliability in professional shooting environments. The new lens is fully 4K-ready, with a high optical resolution and support for Super 35mm large-format cameras. An 11-blade aperture diaphragm helps ensure an artistic and beautiful representation of out-of-focus areas (or “Bokeh”). The lens also features a high 7x zoom magnification, wide focal length range of 17mm to 120mm with T2.95 at 17-91mm, T3.9 at 120mm, and a 180º smooth rotating focus ring. 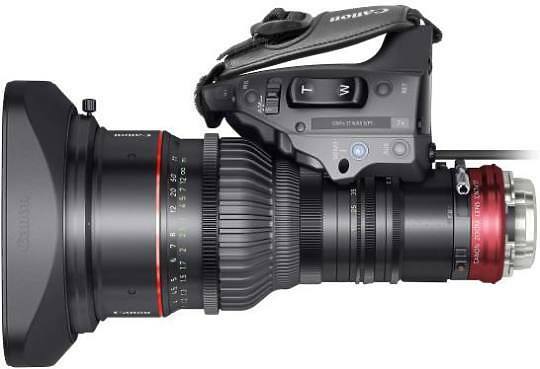 Acknowledging that broadcasters often need to control zoom, focus and iris/aperture in different ways than filmmakers, Canon has developed this zoom lens with full external servo control for drama, documentary and other broadcast productions.